After a long flight over the North Atlantic, the coastline was finally visible through the airplane window. The landscape became more apparent as we descended – vast plains of bare rock, with tufts of steam wafting up from geothermal vents. The plane touched down amid a barren landscape, making me wonder if in fact we had gone off course and mistakenly arrived on the moon. My seatmate looked troubled. “Are we here?” she asked, with concern in her voice. 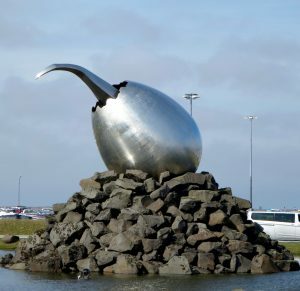 Iceland is a unique circumstance of geology. The island sits atop one of Earth’s tectonic boundaries. Plate tectonics refers to the way that continent-sized rafts of solid rock, called ‘plates,’ float on hot, fluid material below. Earth’s plates move slowly, at an average rate of just one inch per year. 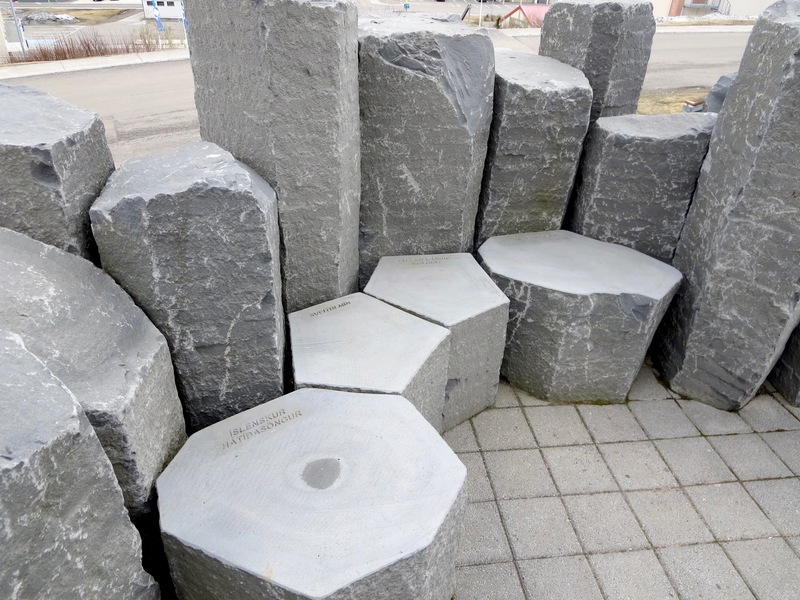 Almost all of the geologic action on our planet happens at the edges of plates – where adjacent plates bump together, scrape past each other, or rip apart into two pieces. These activities create things like mountain ranges, earthquakes, and volcanoes. Iceland straddles the Mid-Atlantic Ridge. Here, the Earth’s crust is being pulled apart; the North American plate and the Eurasian plate are moving off in opposite directions as the Atlantic Ocean widens. There is a distinct seam that runs up the middle of the ocean floor, where the crust gets yanked apart, then fills in with lava. It yanks apart some more, and then more lava oozes out. In this manner, the entire ocean crust is built. 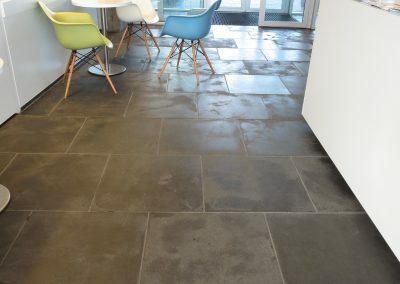 The lava rock is basalt, an igneous rock that is dark grey or black. All the ocean basins, everywhere in the world, are underlain by basalt. 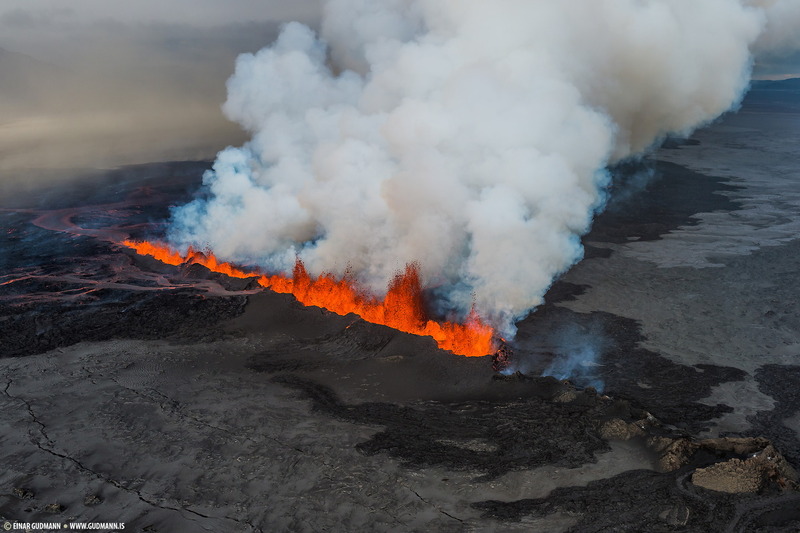 A rift in the Earth erupts with fiery lava in this 2014 eruption in Iceland. Image by Sparkle Motion, reused via Creative Commons license. Iceland’s section of the Mid-Atlantic Ridge is a bit hyperactive. It’s particularly hot and it erupts a lot of lava. So much lava, in fact, that it has built itself up above sea level. 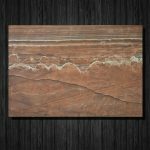 As a geologist, I am fascinated by the notion that you can observe the same process that normally happens at the bottom of the ocean, but up on land. 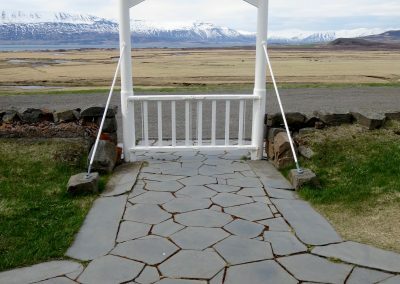 In a place called Thingvellir, you can wander among lava flows and rifts in the landscape, and easily see how the place is being pulled apart. 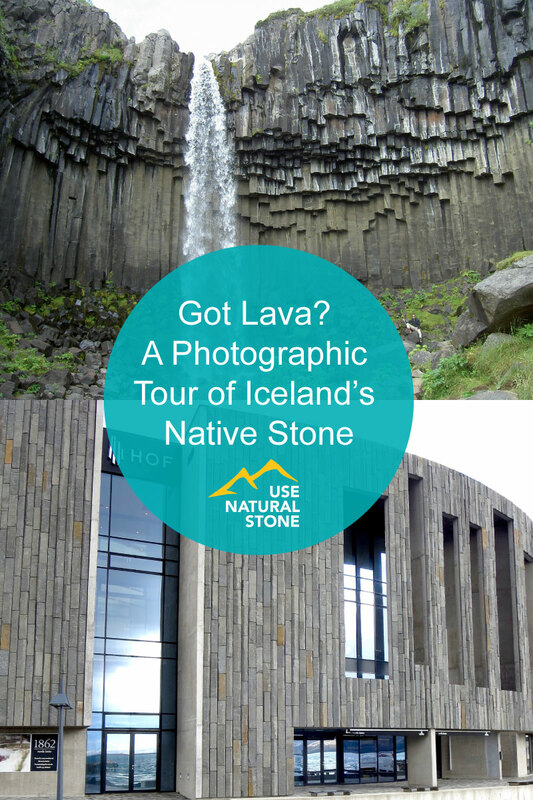 You can also see volcanoes large and small, hot springs, geysers, steam vents, and fumaroles. Iceland is like a geologists’ candy store. 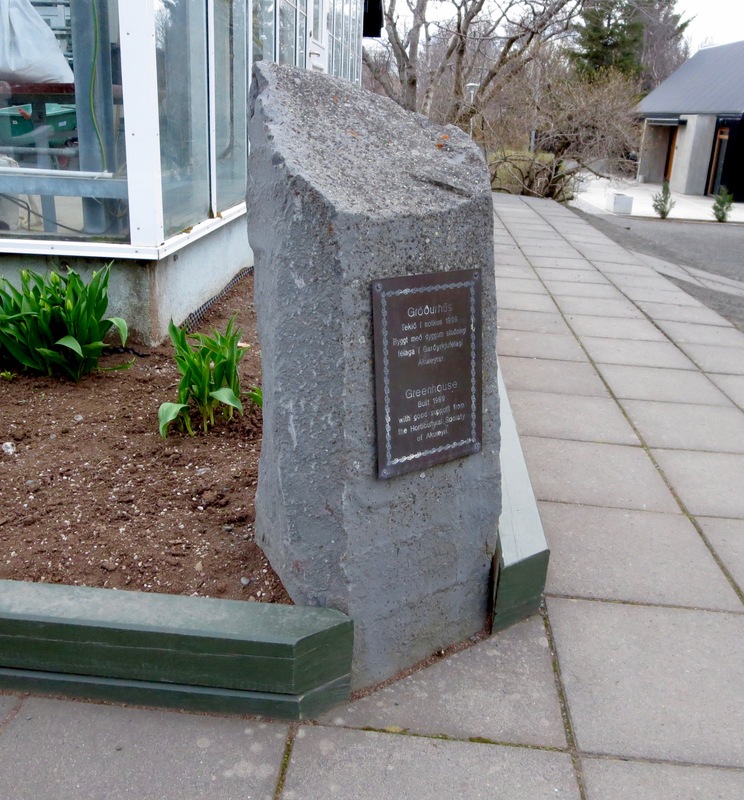 As with everywhere else along the Mid-Atlantic Ridge, the lava that erupts out of the rift is basalt. You may be familiar with Absolute Black, Premium Black, and similar fine-grained, dark-colored stones. 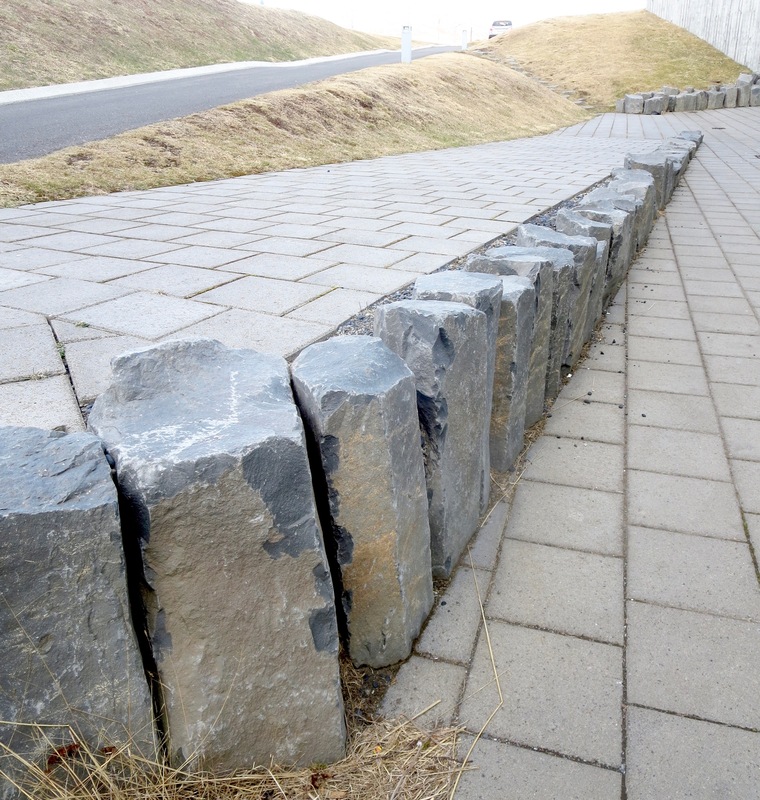 These are commercial versions of basalt (or its close cousins). 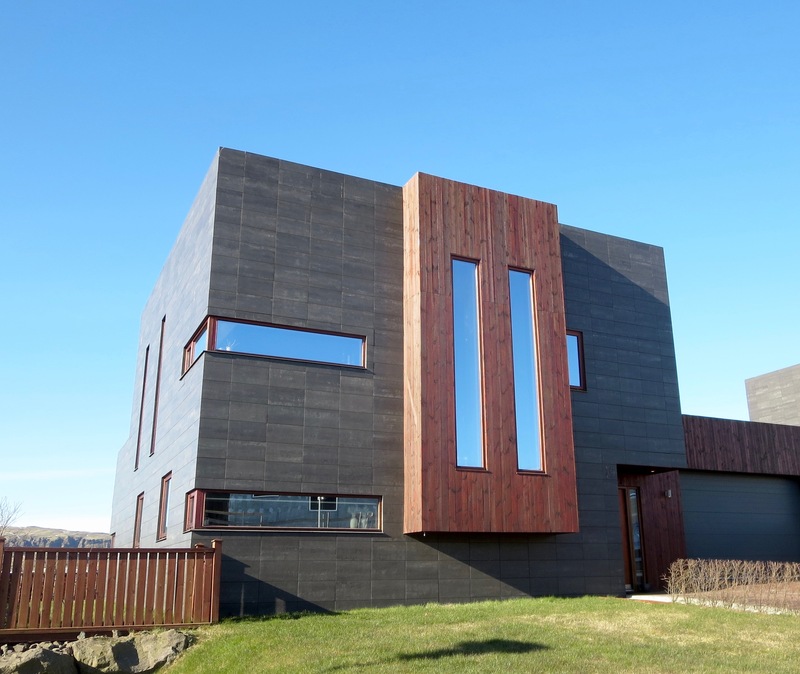 Iceland is built of layer upon layer of cooled basalt lava flows. 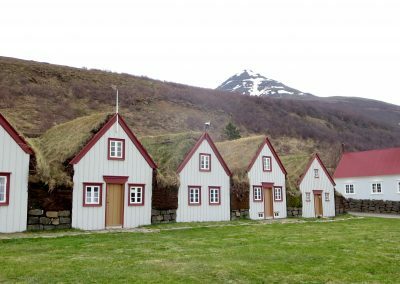 Icelanders are justifiably proud of their volcanoes, their wild landscape, their insane weather, and their native lava rock. 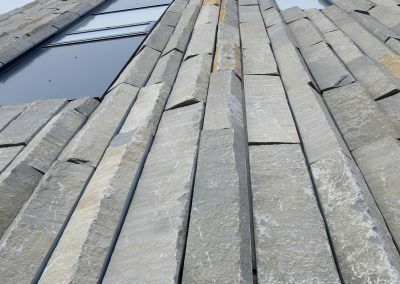 It makes perfect sense that they’d use this stone in a variety of ways, which is not only a pragmatic use of an abundant material, but also ties their architecture to the natural environment that makes Iceland so special. 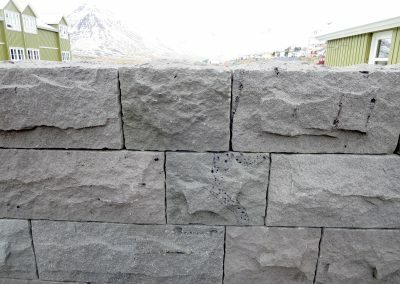 On a recent trip to Iceland, I set out to find examples of how the native stone was used. 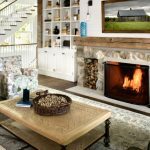 I was happily surprised at the wide range of uses I encountered, from historic settlements to starkly modern new construction. Svartifoss waterfall. Image from Pixabay. 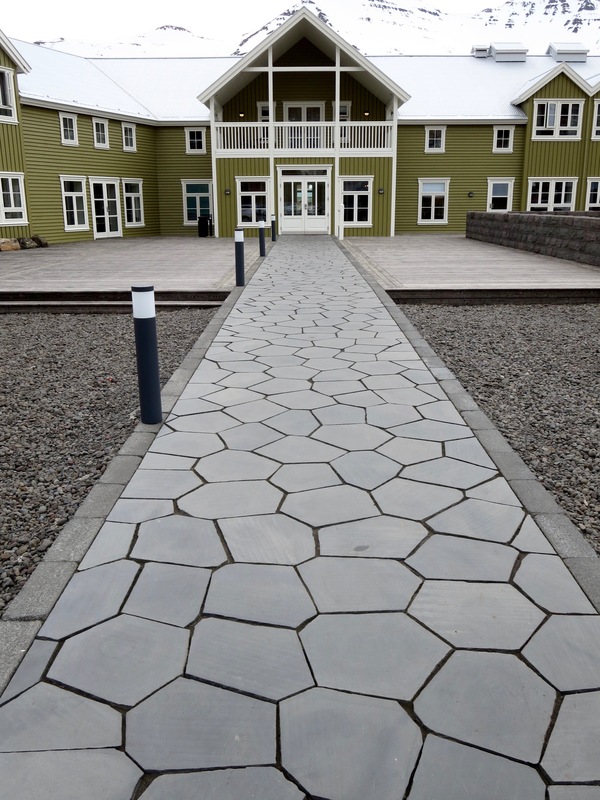 Before we dive into the architectural uses of basalt lava, it’s worthwhile to understand the characteristic pattern formed by this stone. 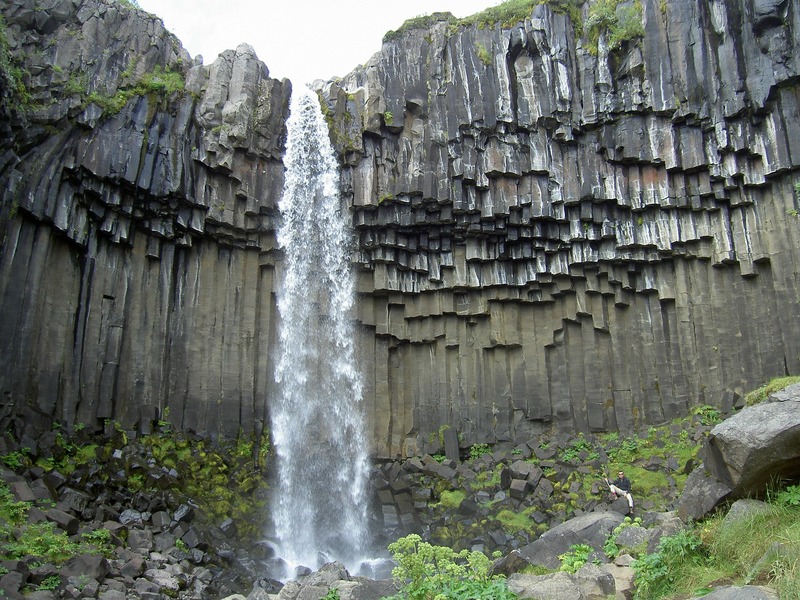 Basalt lava flows tend to cool and crack into hexagonal columns, like a giant bundle of pencil-shaped stone. 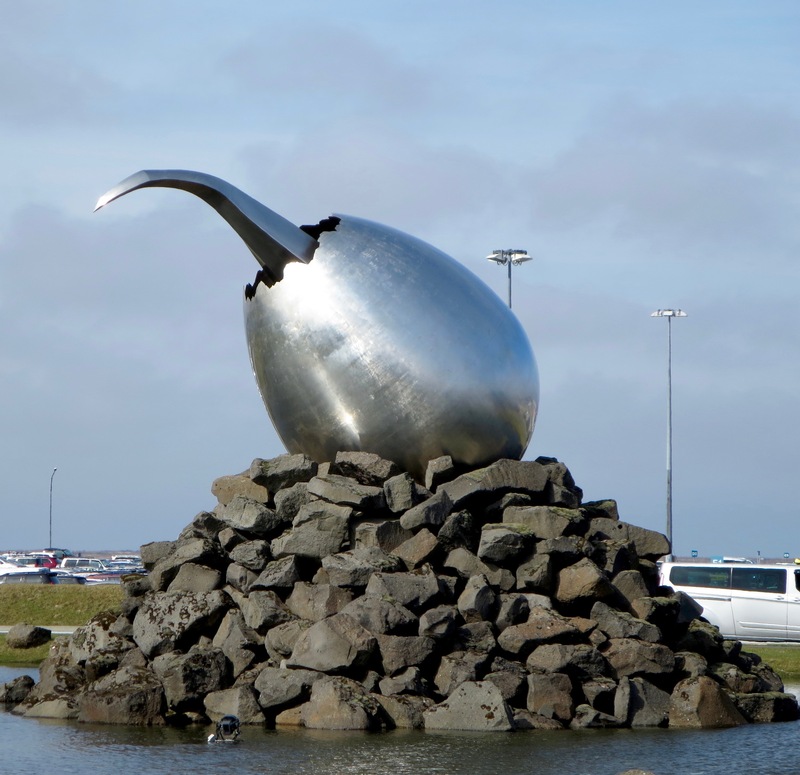 This distinctive rock forms the backdrop for many of Iceland’s iconic waterfalls. 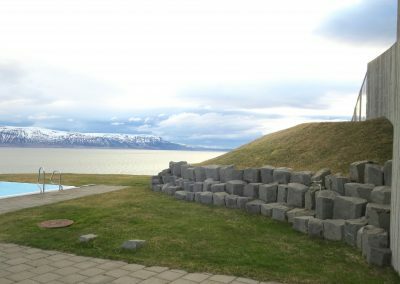 Basalt columns are a familiar theme, and it was especially fun to see how Icelanders incorporated them into their designs. 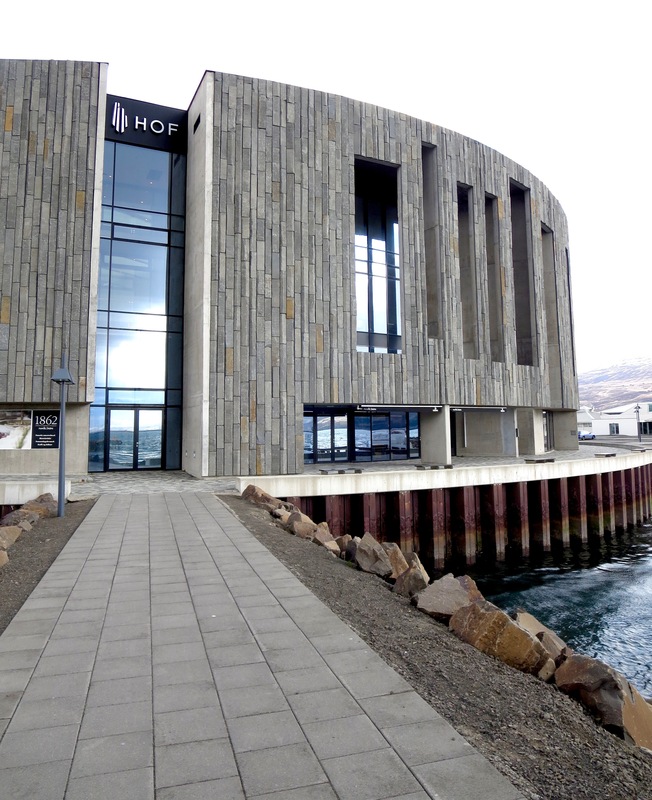 The Hof is a conference center and performing arts venue in Iceland’s vibrant northern city of Akureyri. 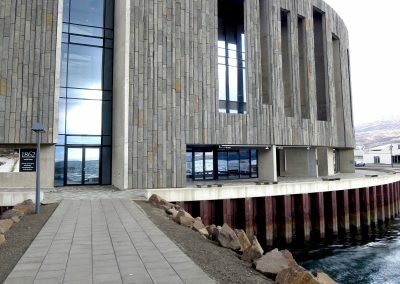 This prominent building is a stone-clad cylinder, situated right on the harbor. 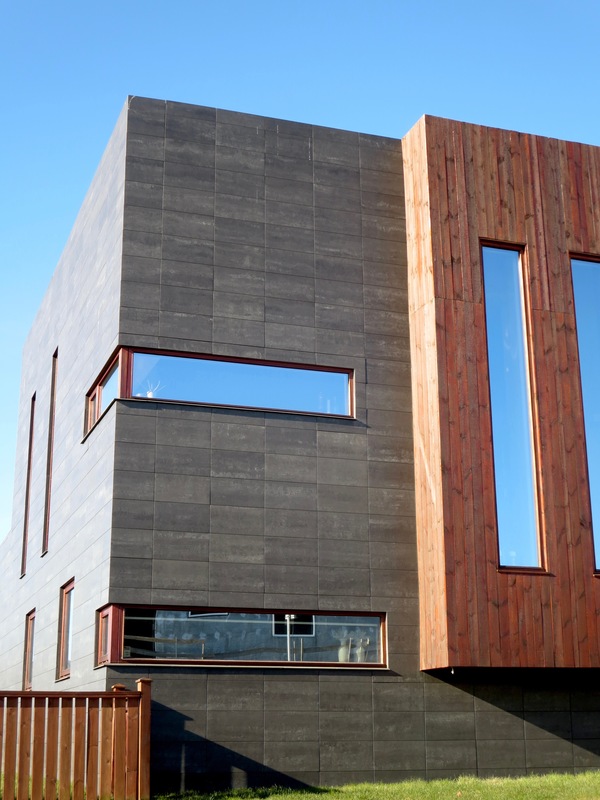 Its sleek Nordic design gives a nod to local materials. Image by Karin Kirk. 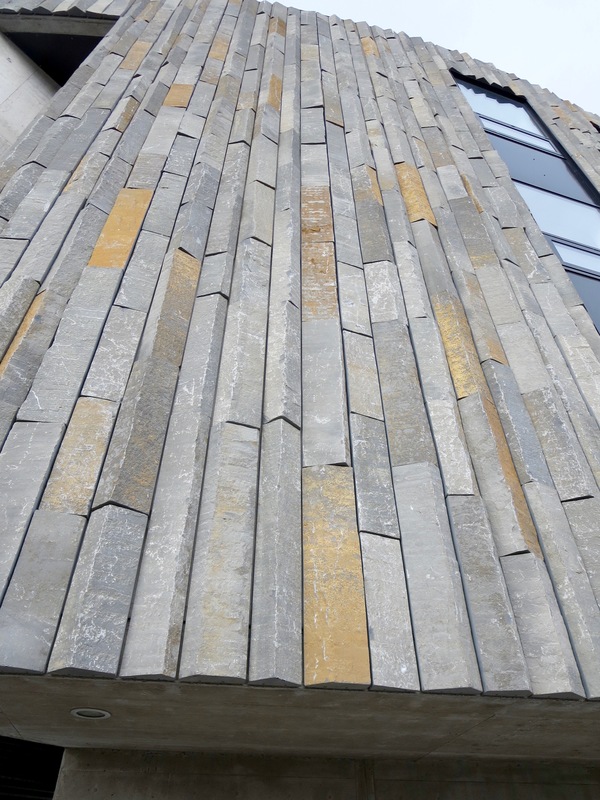 Only up close do you realize the stone cladding is made of basalt columns, sliced lengthwise. Standing underneath the building and looking up reveals the shape of the columns. Image by Karin Kirk. 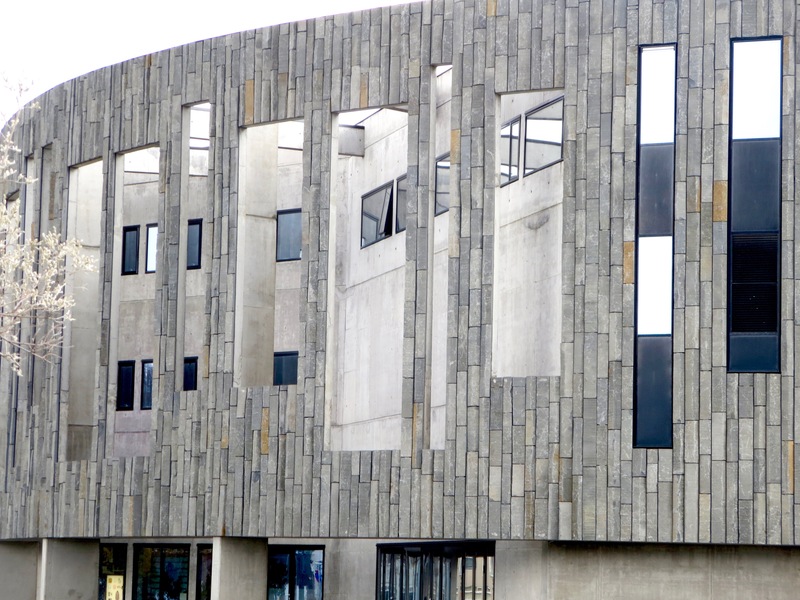 The Hof has some architectural intrigue. Part of the building is set inside the basalt ‘skin’ of the structure. Image by Karin Kirk. 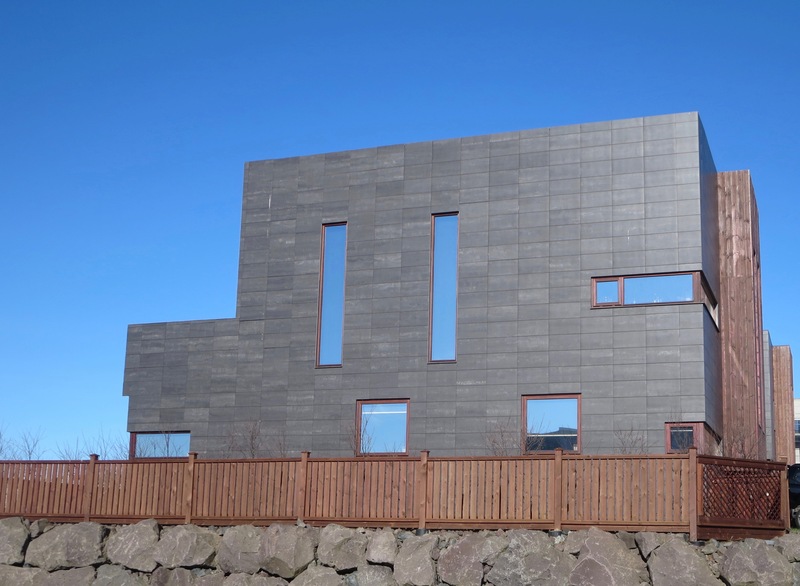 This modern residence outside Reykjavik is clad with honed basalt. Image by Karin Kirk. 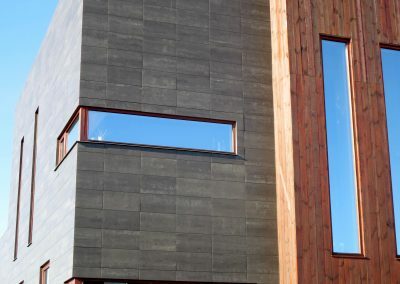 The mirrored windows almost look like cut-outs that poke through the building to reveal the vivid blue sky behind. Image by Karin Kirk. 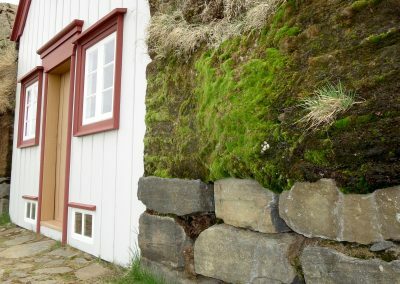 Transitioning from the modern to the historical, a manor farm uses basalt blocks as a foundation, with layers of sod on top of the stone. Sod also covers the rooftops. 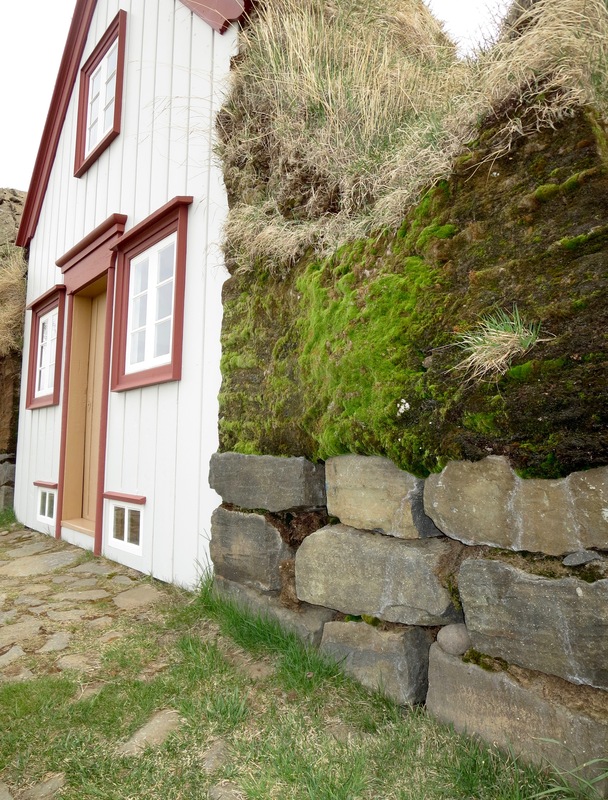 This farmhouse was built in 1870 in Laufás, Iceland. Image by Karin Kirk. 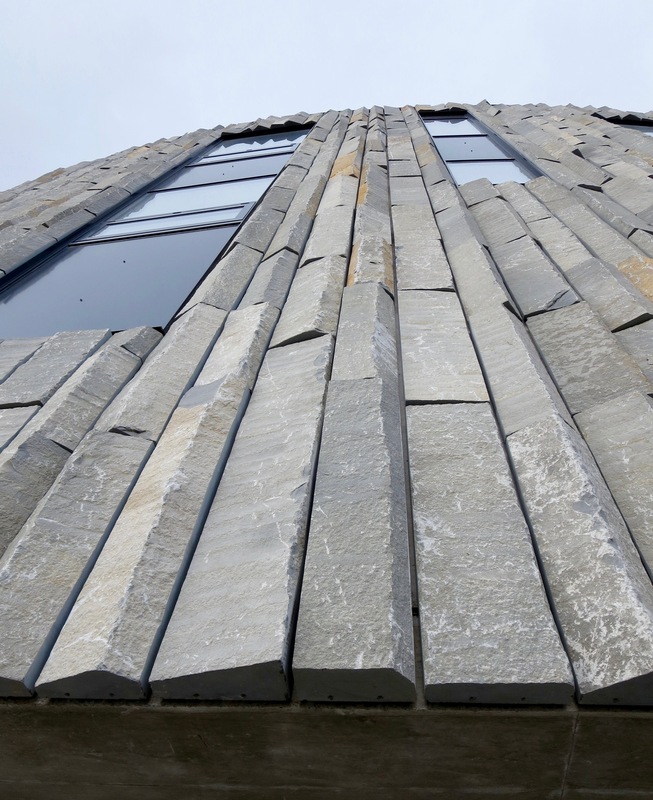 Dry-stack basalt stone walls are used around the church. Image by Karin Kirk. If you are wondering what the dreamiest place on Earth looks like, here it is. 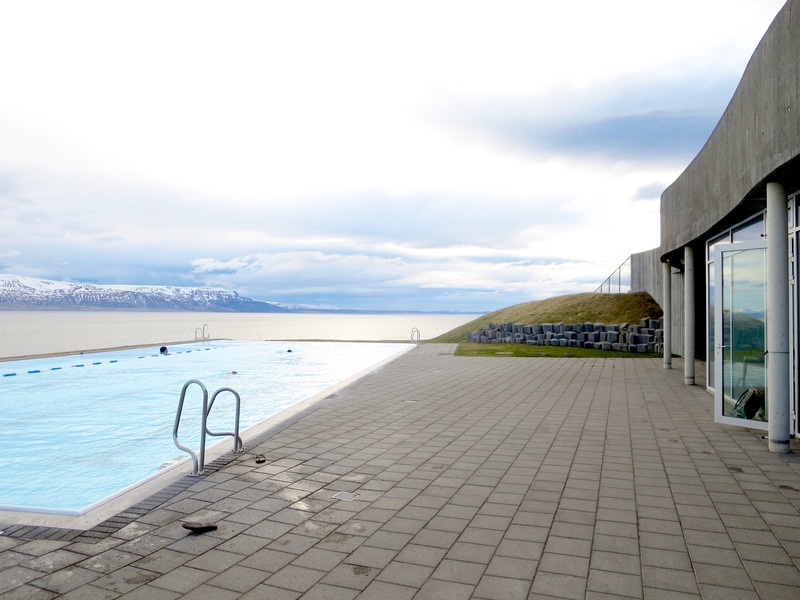 This infinity pool at Hofsós gazes right out into a fjord. A key distinction is that the fjord is icy cold, while the pool is geothermally hot. Image by Karin Kirk. 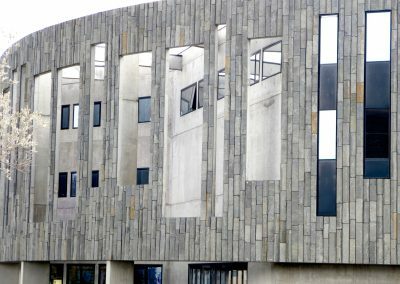 Retaining walls throughout the grounds are made from basalt columns, and the floors inside are laid with large format, honed basalt tile. 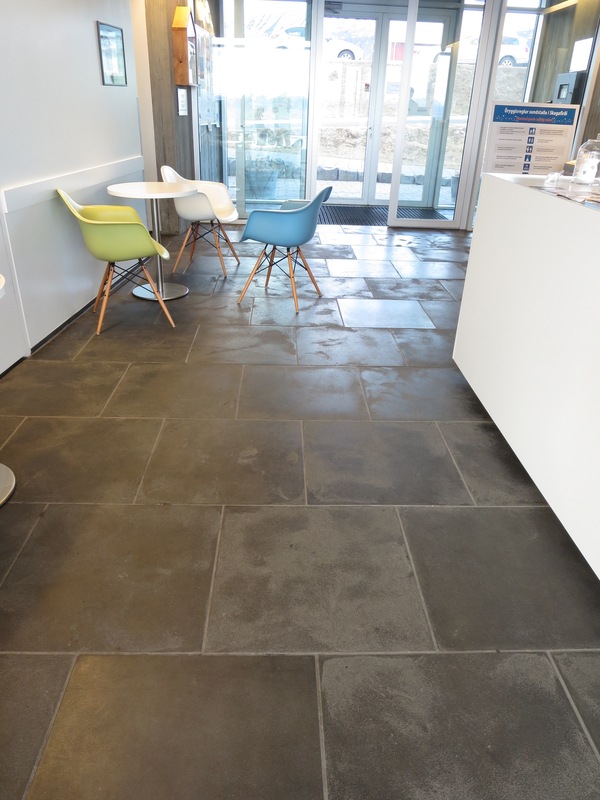 The use of natural stone throughout the facility evokes the volcanic nature of the hot water. Image by Karin Kirk. 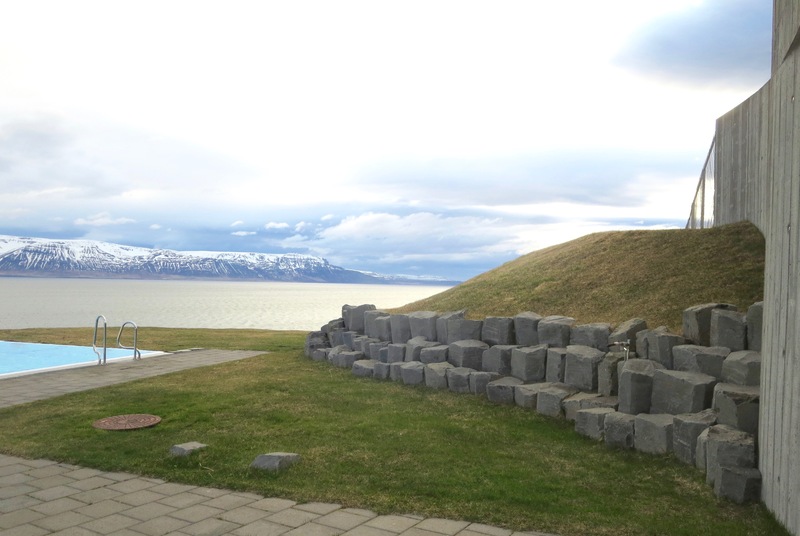 The Hofsós hot springs have several accents made from basalt columns. The source of the columns is a cliffside beach nearby. Image by Karin Kirk. 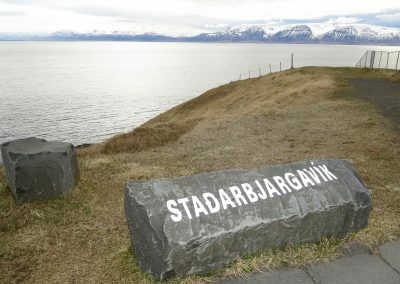 Stađarbjargavík (rolls right off the tongue, doesn’t it?) 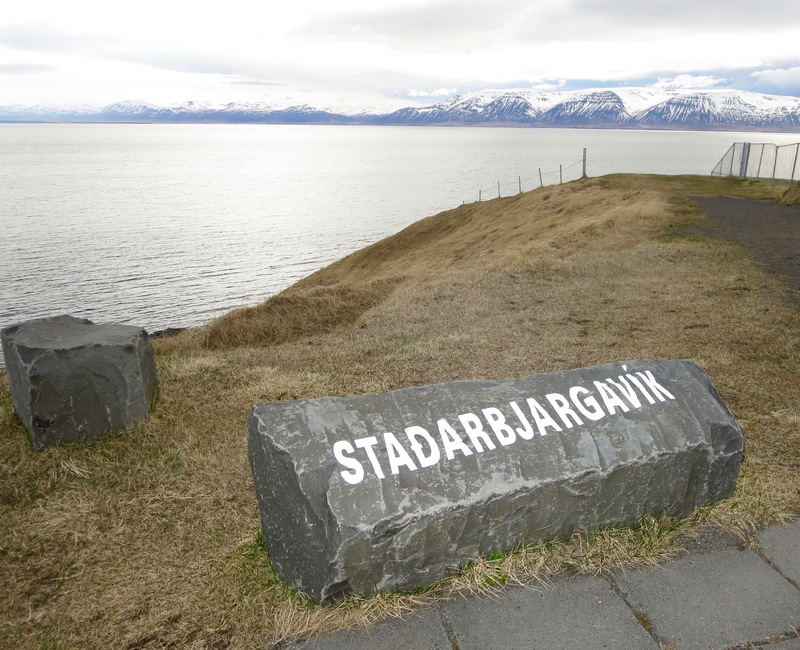 is the name of the location of the basalt. Image by Karin Kirk. 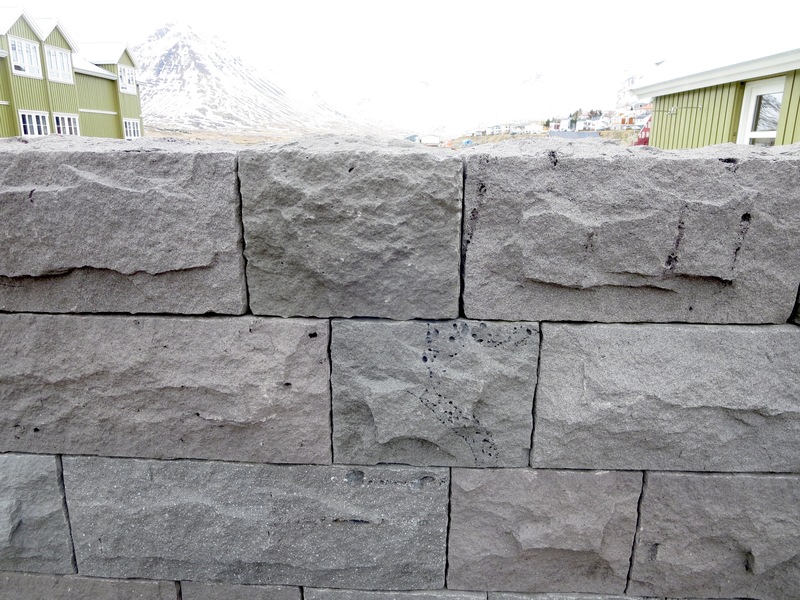 Who says you need rectangular stones to make a tidy wall? 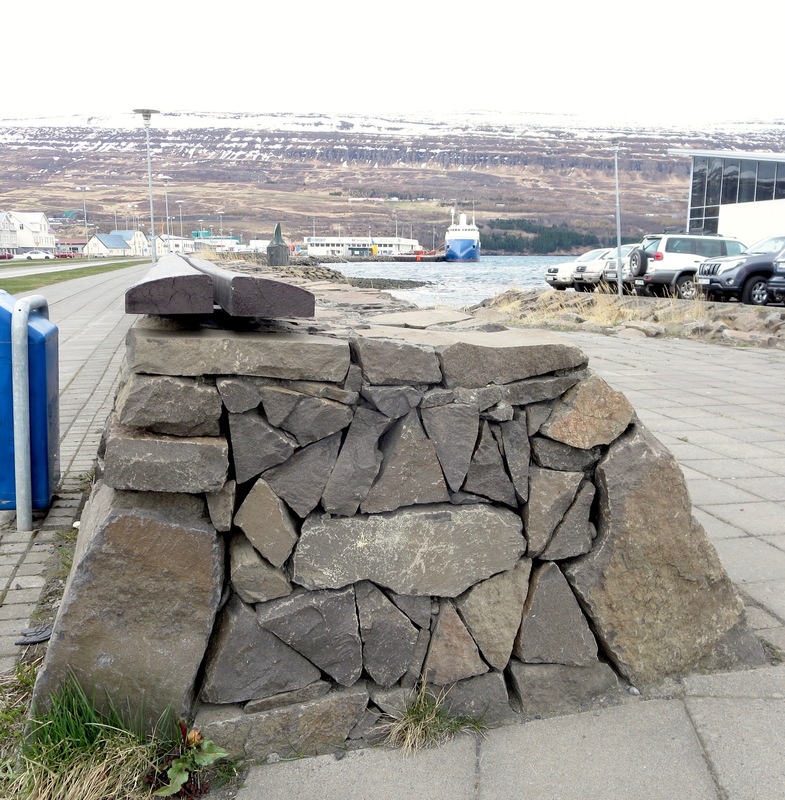 This dry stacked wall in Akureyri displays impressive masonry skills. Image by Karin Kirk. 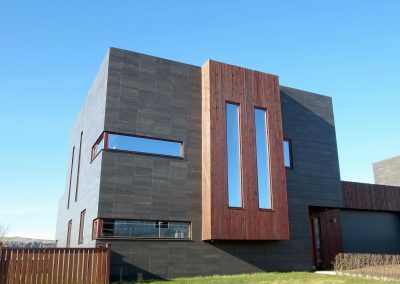 At first glance this looks like ordinary modular concrete block. But a closer inspection reveals that it’s actually lava rock. The telltale sign is the presence of Swiss-cheese-like holes, caused by gases in the lava. Image by Karin Kirk. 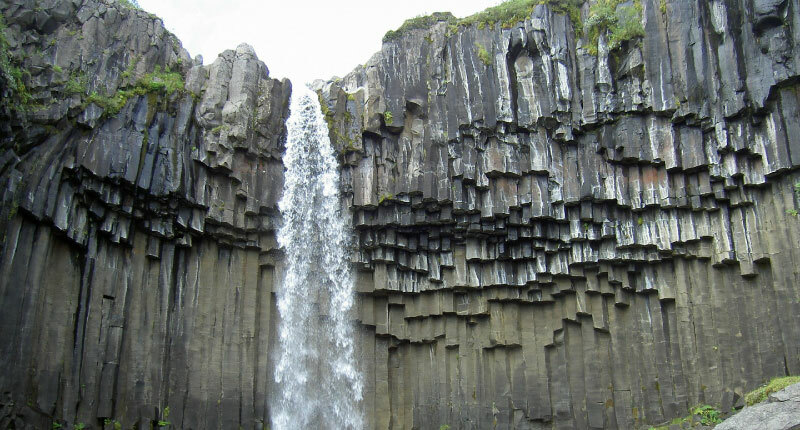 Basalt lava naturally cools into hexagonal columns. 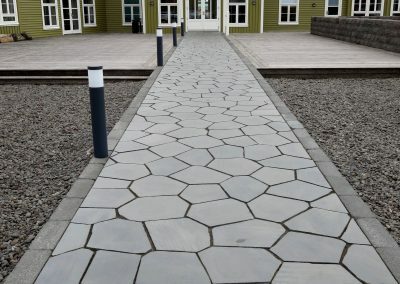 This sidewalk at the Sigló Hotel is made from slices of basalt columns. Image by Karin Kirk. 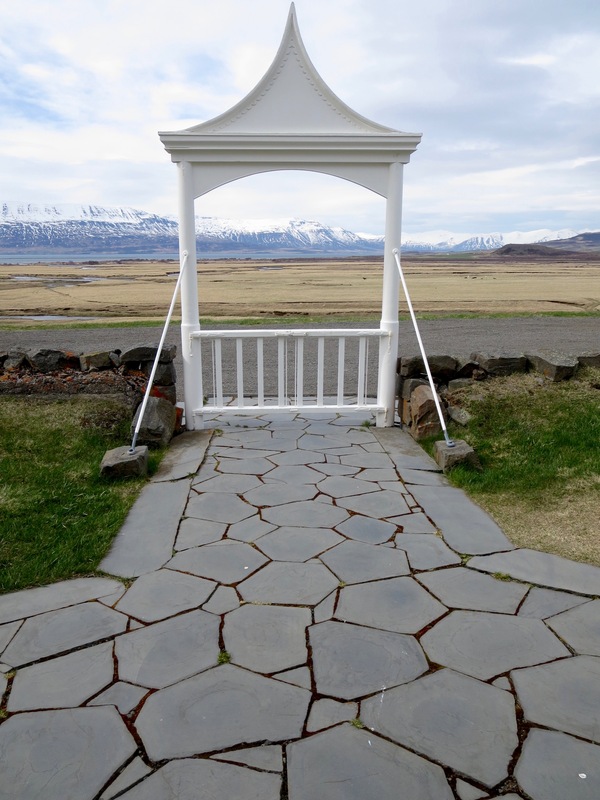 This church walkway uses the same style of cut basalt columns, but with the added bonus of a pretty gate that frames the view. Image by Karin Kirk. 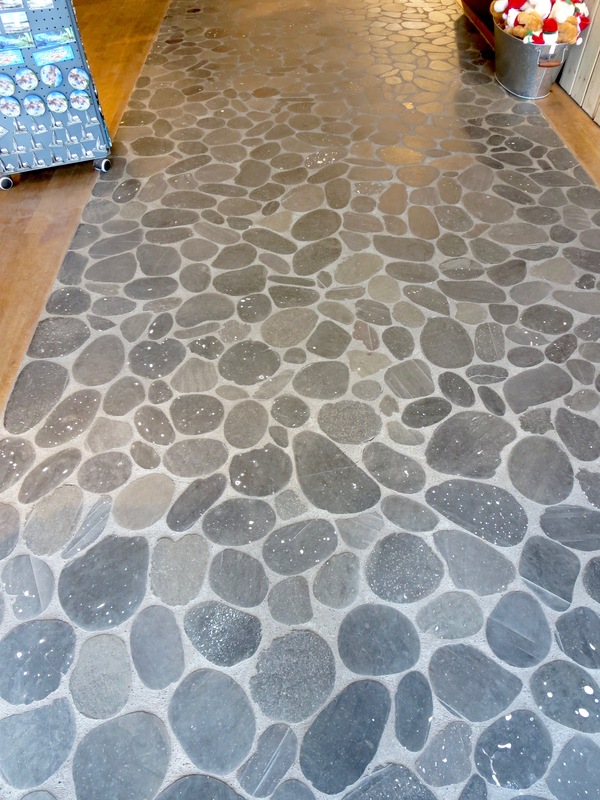 The walkway in a gift shop is made from basalt cobbles that were cut in half, polished, and set in concrete. 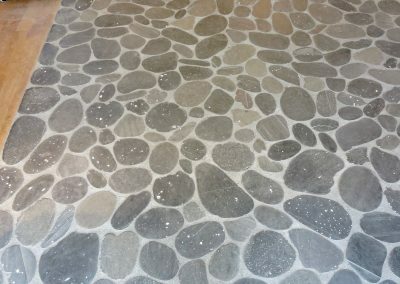 The white speckles seen in some of the stones are deposits of calcite that have filled in the original pore spaces in the stone. Lava rock is commonly full of holes caused by gases in the lava. Often the pores get filled in by another mineral after the fact. If you want to sound exceptionally smart (or maybe just nerdy) you can call this stone amygdaloidal basalt. Image by Karin Kirk. 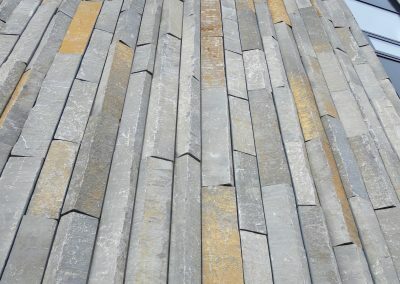 Basalt does not naturally cleave into thin layers. 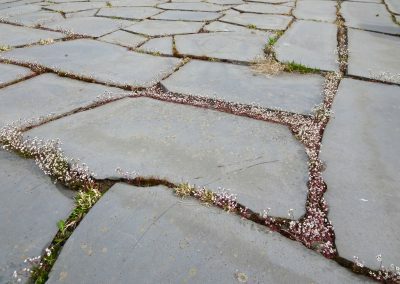 This flagstone was likely made by cutting the blocks. 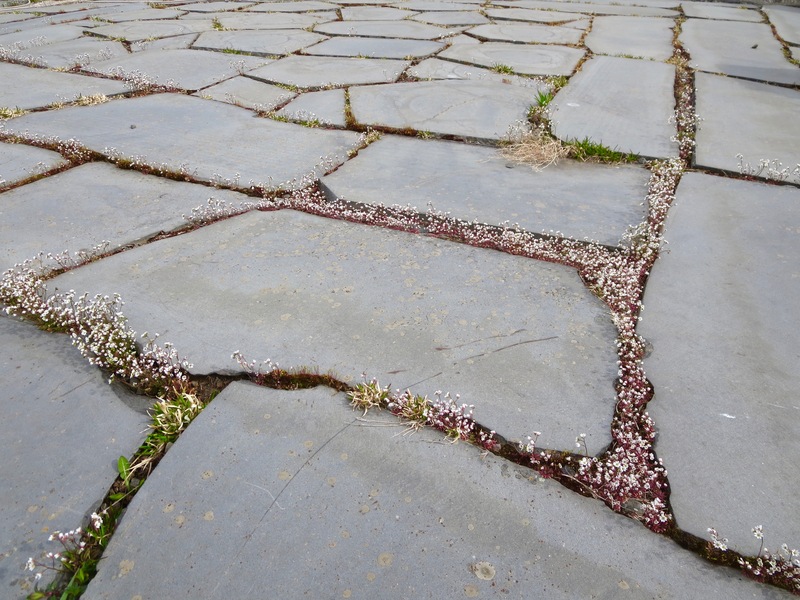 Alpine wildflowers have sweetly colonized the joints between the stones. Image by Karin Kirk. 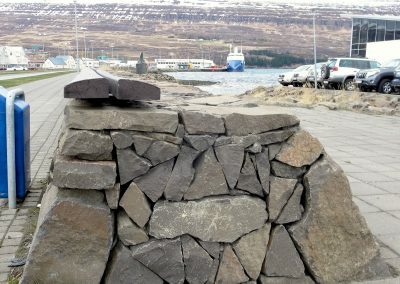 The plaza in front of the church in Siglufjörður has a seating area made from basalt columns. Image by Karin Kirk. 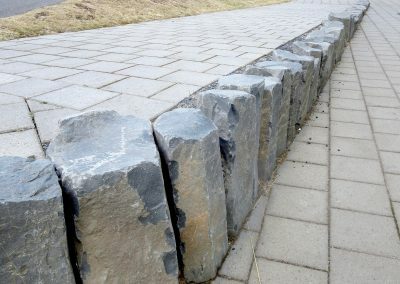 Basalt columns make handy signposts, since they have naturally flat sides. 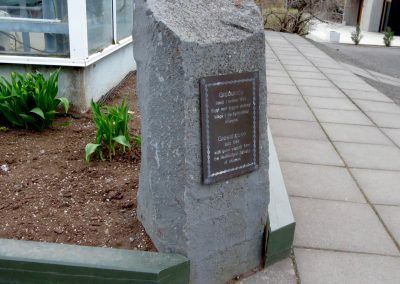 This one displays a description of the greenhouse at the Akureyri botanical garden. Image by Karin Kirk. 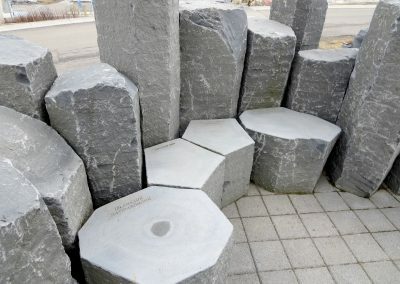 This photographic tour of Iceland’s natural stone might inspire you to visit Iceland, or consider the ways you can use your own native stone, or both. 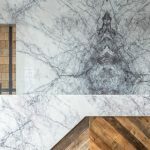 Like many of us, Icelanders clearly have a deep affinity for their landscape, which makes it even more satisfying to use materials that reflect one’s local geology.